SeaWorld San Diego rescues more than 100 marine mammals each year and returns most of them to the wild. Here’s one sea lion’s story. 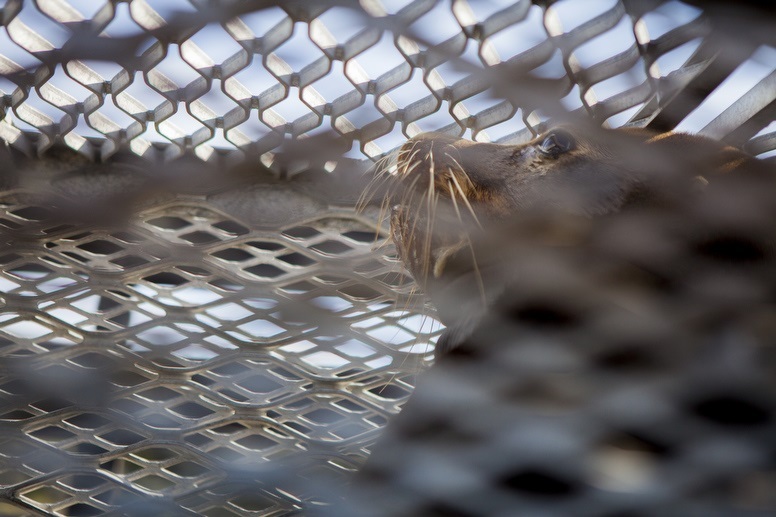 When Del Mar lifeguards found him on a Thursday in late January, the young sea lion with a cloudy left eye quietly laid his head on a rock. They could tell Rocky – as he’d later be called – wasn’t well. Sea lions are typically lively. This one was sluggish. The lifeguards called SeaWorld San Diego’s stranded animal rescue team, a group that rehabilitated almost 440 marine animals last year amid a spike in ailing young sea lions along the coast. SeaWorld says it typically rescues 100 to 150 per year, plus another 200 to 300 birds and a handful of other animals. SeaWorld has touted its rescue and research operations in recent months as part of its effort to combat the backlash associated with “Blackfish,” a documentary that blasts the company’s confinement of killer whales. Fans of the movie criticize SeaWorld for focusing more on profits than on efforts to protect orcas and other marine animals in the wild. 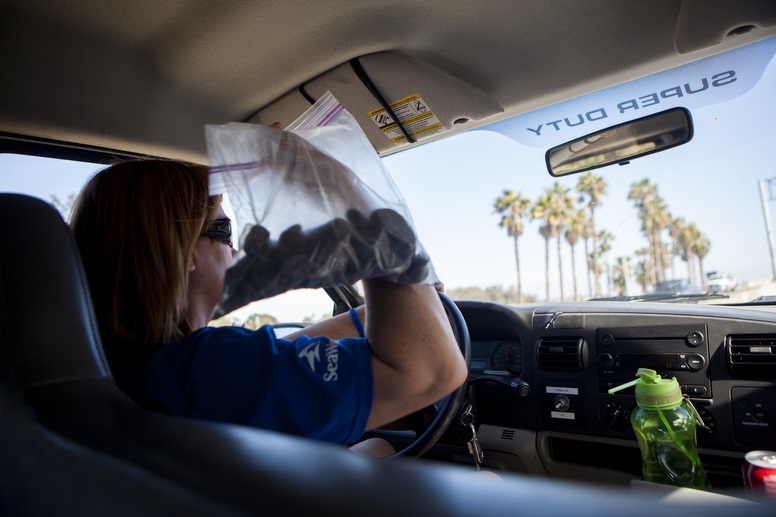 SeaWorld contends that it invests heavily in conservation and points to its rescues as proof. And in the past year, the animals that have benefited most from SeaWorld’s care are emaciated California sea lions like Rocky. This week, SeaWorld stranded animal coordinator Jody Westberg shared Rocky’s story with photographer Sam Hodgson and I as we tagged along for the end of his journey with SeaWorld. On that day in late January, Rocky barely protested as a few rescue workers and lifeguards loaded him into a cage, Westberg recalled. When he arrived at SeaWorld, caretakers tested Rocky’s blood and placed him in a small pool where they could watch him around the clock. SeaWorld workers soon discovered Rocky was mildly anemic and suffered from some mental issues. They estimated he was about 8 to 10 years old. They named him Rocky after he vomited up four pounds of stones within his first five days at SeaWorld. Team members focused on helping Rocky eat more fish. At 312 pounds, he was lighter than most sea lions his age. They slowly increased his meals each day to prevent him from getting sick, building up to about 30 pounds of fish each day. They also put him in a pool with other sea lions. Rocky needed to learn to catch his prey again, and to compete for it. He needed to regain the necessary strength and energy to swim again. 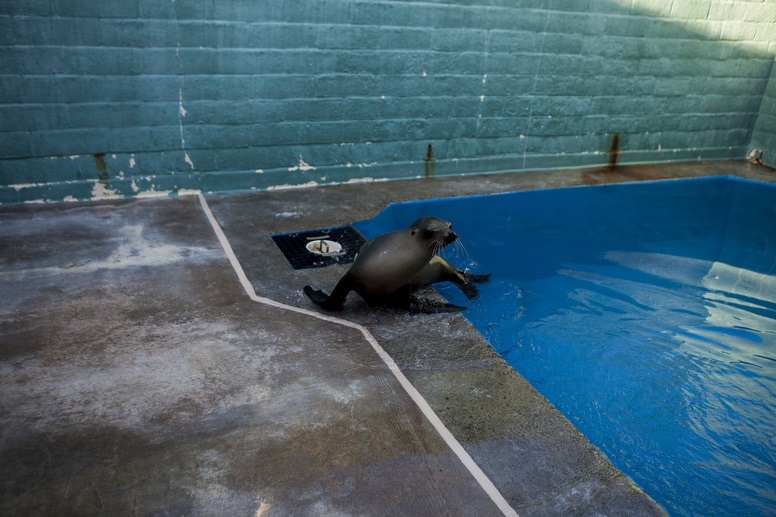 Within about six weeks, Rocky was besting the other sea lions at SeaWorld’s rehabilitation center. He gained nearly 80 pounds. That showed Westberg that Rocky was ready to return to the wild. 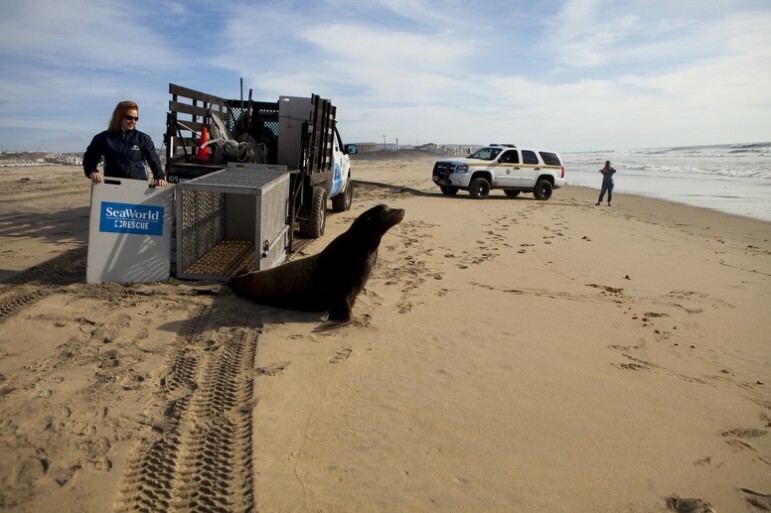 SeaWorld’s rescue team sometimes boards a boat and returns marine mammals directly to the ocean but Westberg decided the beach at Border Field State Park would work for Rocky. 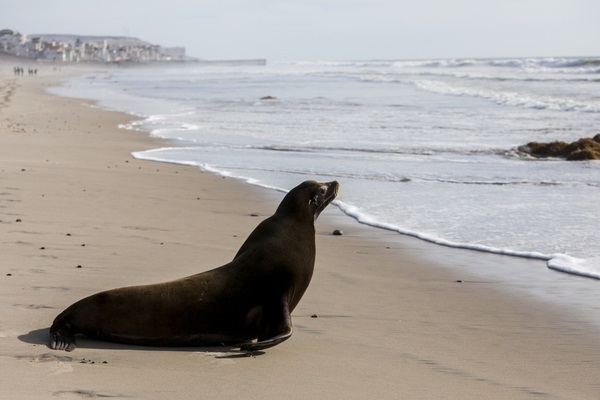 There’s a sea lion rookery in the area and plenty of fish to be caught. So on Tuesday, at about 2:30 p.m., Westberg and other SeaWorld staffers loaded Rocky into a large crate and placed him in the back of a big white truck. Rocky, who is now about 390 pounds, squirmed and barked as he awaited the roughly 28-mile drive south. At the beach, a U.S. Fish and Wildlife Service officer, Westberg and another SeaWorld employee used a lift to lower Rocky’s crate to the ground. He waddled out without hesitation. He headed swiftly toward the ocean. 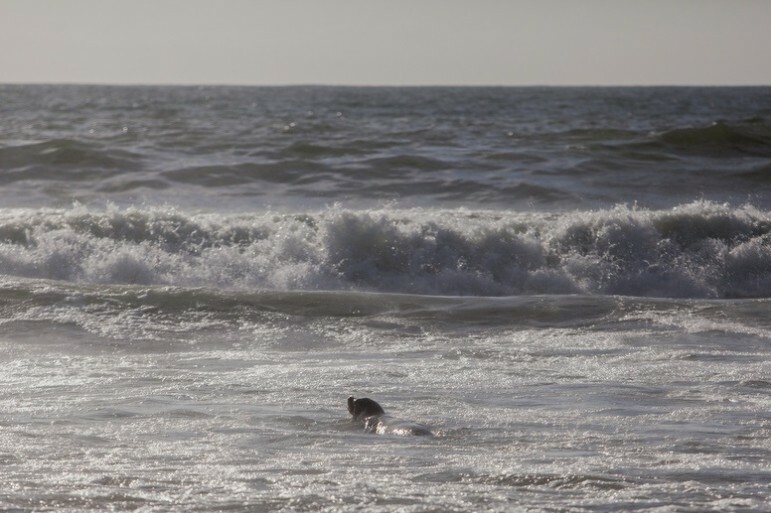 He slowly disappeared into the Pacific Ocean. Westberg was surprised at first. Rocky didn’t even take a moment to look around. He went straight to the water. He knew what to do. The crew watched as he swam away, catching occasional glimpses of Rocky’s head as he swam through the tide. After a few minutes, they loaded up the truck and drove back to SeaWorld. Westberg, who supervised Rocky’s care for weeks, wasn’t emotional as she drove away. After one animal is returned to the wild, it’s time to focus on others that still need help, she said. 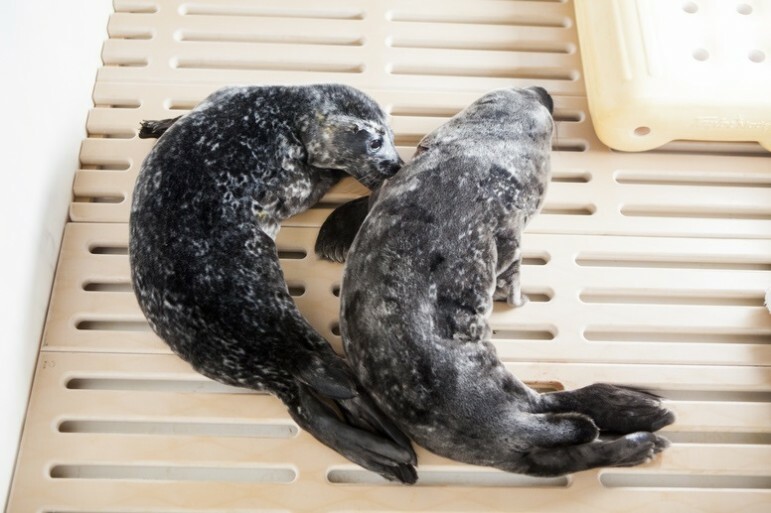 Within the last week, the SeaWorld team rescued these two young harbor seal pups. One is badly swollen after an injury to its neck area. The other constantly suckles at its companion, instinctively hoping to find its mother’s milk. 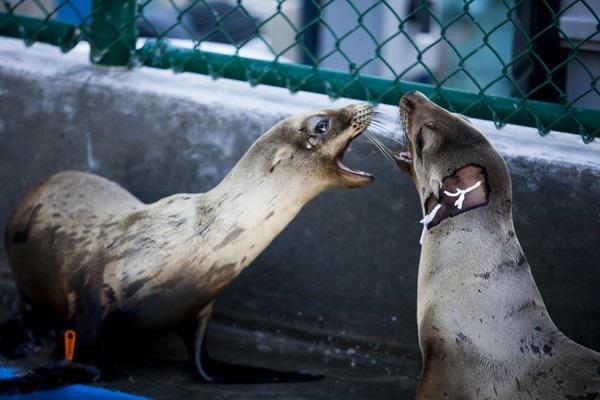 SeaWorld rescuers watched both the seals for hours before taking them to SeaWorld. SeaWorld workers wants to ensure mothers haven’t simply left their pups behind for a short time before they recover them, Westberg said. These seal pups’ mothers never returned. SeaWorld staffers have since used tubes to nourish them. They’re working to transition them to bottles soon. 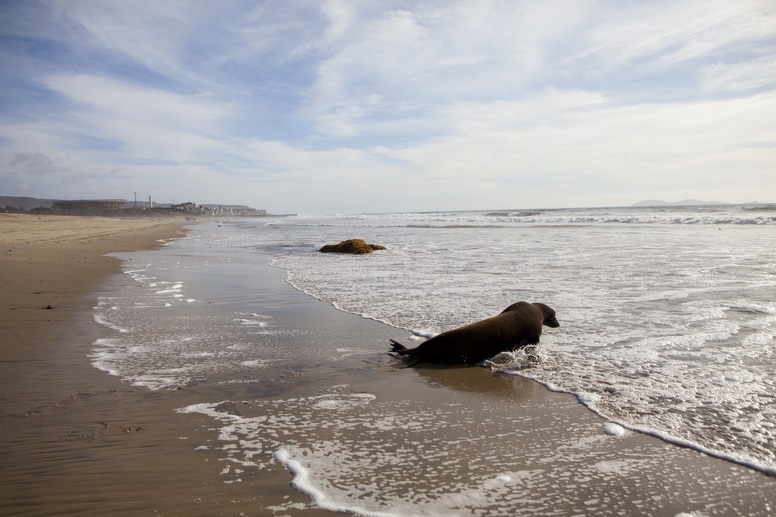 Then there’s the older sea lion pup with a large abscess under one ear. SeaWorld workers dressed the wound so they can easily flush it out. SeaWorld says almost all the animals it rescues eventually go back to the wild but there are some exceptions. Take Bruce, a large green sea turtle who now lives in the park. National Oceanic and Atmospheric Administration researchers brought Bruce to SeaWorld in 2011 after they found him with cuts on his flippers and tail and a cracked shell. X-rays also revealed four shotgun pellets lodged in his neck, SeaWorld spokesman David Koontz said. SeaWorld returned Bruce to the wild after several months of rehabilitation. About five months later, rescuers found Bruce tangled in fishing line. He’d also ingested multiple candy wrappers. SeaWorld rehabilitated Bruce again, Koontz said, but park and NOAA experts decided the wild was too treacherous for him. SeaWorld agreed to continue caring for Bruce and he now lives in SeaWorld’s Turtle Reef exhibit. How much efforts to rescue animals like Bruce and Rocky cost SeaWorld — and how that spending stacks up against overall revenue — isn’t clear. Koontz declined to reveal a dollar figure, and said the company’s publicly traded status keeps it from elaborating on its financial reports. SeaWorld’s financial reports and U.S. Securities and Exchange Commission filings don’t shed any light, either. They simply note that the company has helped more than 23,000 ill, injured or abandoned animals in the last four decades. Some bloggers and the Oceanic Preservation Society, a marine conservation nonprofit, have suggested SeaWorld has spent less than 1 percent of its annual revenue on rescue and conservation efforts in the last decade. 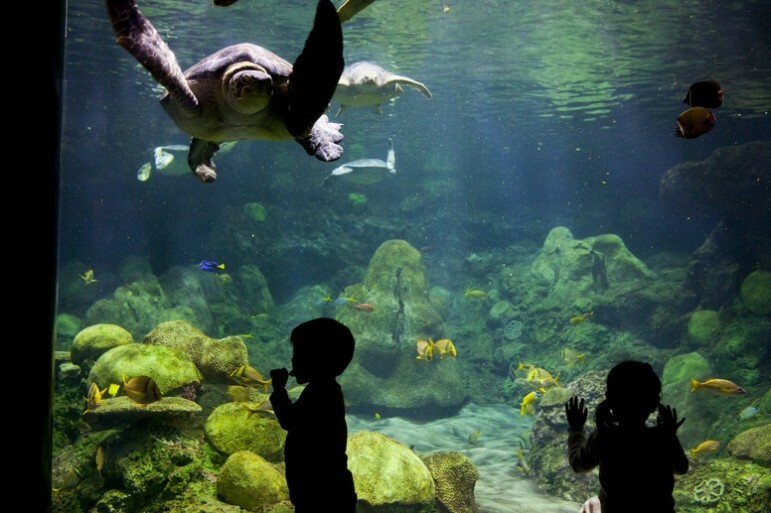 That conclusion appears to be based on documentation from the SeaWorld & Busch Gardens Conservation Fund, a nonprofit affiliated with the company that offers grants to outside organizations that work on animal conservation, research and rescue efforts. The group has granted more than $10 million to more than 500 worldwide projects since it was created in 2003. Beneficiaries have included the World Wildlife Fund, Sea to Shore Alliance and many others. But Koontz said the foundation isn’t subsidizing SeaWorld’s rescue efforts. “We fund that program ourselves,” the spokesman said. All photos by Sam Hodgson. This is part of our Quest: SeaWorld series digging into the park’s impact on our region. Check out the previous story – SeaWorld San Diego, By the Numbers – and the next in our series – So-Called Blackfish Bill Could Devastate SeaWorld.